Lexus has recently been making interesting cars, or practical cars. The new UX crossover is something new: an interesting practical car. In early September, we flew to Stockholm, Sweden, to drive Lexus's all-new UX crossover. 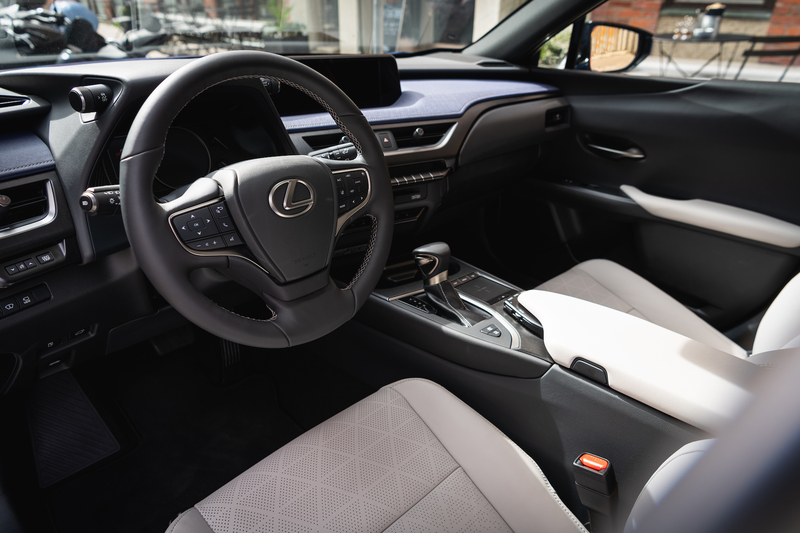 Many test drive itineraries endeavor to escape congested metropolitan areas for winding back roads, but Lexus built the UX for the "creative urban explorer," so city driving was a must. We found a high-tech and super stylish city that never honks, loves hotdogs, and appreciates the virtues of a compact car with a sensible motor. 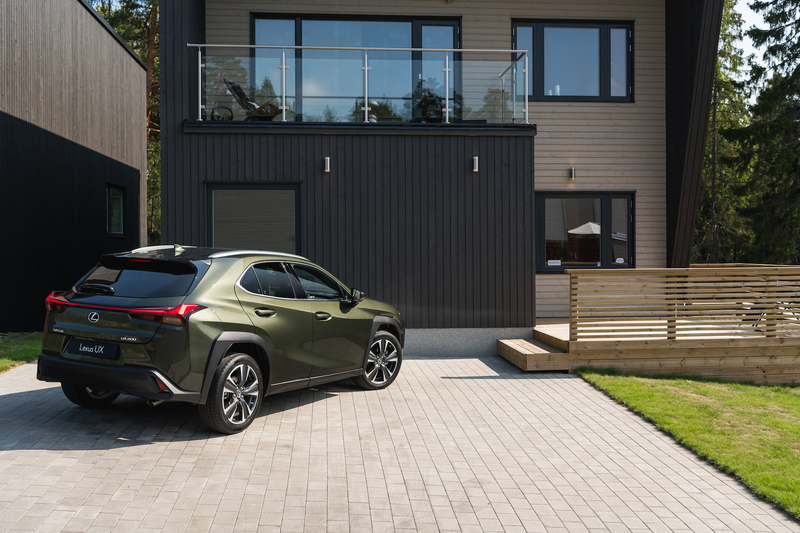 The Lexus UX 200 Luxury. What is it? A small crossover aimed at the entry-level urban luxury buyer, and Lexus's least-expensive model. One Big Question: How well can Lexus pull younger buyers? This was the subtext of the vehicle presentation, which included horrific images of aspirational middle management—women doing yoga on piers, smiling men holding cameras or gesturing at laptops—and a nod to the "Xennial" demographic, briefly described as those with an analog childhood and digital adulthood. A bit of research shows the term has been around since at least 2014, a mash-up of "Gen X" and "Millennial," and the birth range is commonly agreed to be between 1977 and 1983. Of course, this is the aspirational version of the UX's true demographic—people for whom, as Lexus says in a press release, "the UX will not only be their first Lexus, but also their first luxury vehicle." In fact, in considering a niche generation, Lexus has produced a niche vehicle for the style-conscious (if not overly savvy) urban professional who ultimately cares about comfort, parking ability, and enough safety tech to keep him distracted. In a city like Stockholm, where we tested the car, the UX made perfect sense: compact, agile, inexpensive, easy to spot and, in its own way, difficult to look away from. 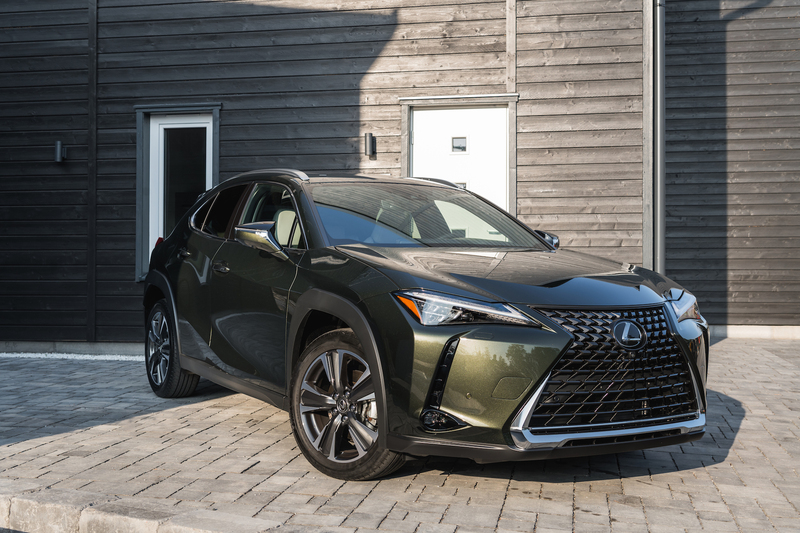 Exterior: The proportions are decent enough—athletic, if a bit hunched, with a squashed greenhouse—though Lexus's exterior design language typically elects to say many things loudly rather than coherently. 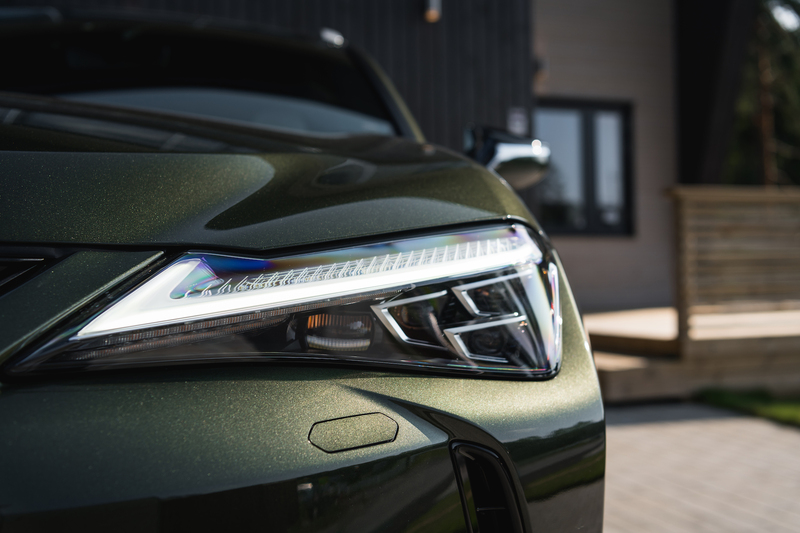 But when you drive in a city with hundreds of thousands of other cars, the ability to stand out quickly is appreciated, and this car's maximalism is not just recognizable, it's now instantly identifiable as a Lexus. You see these cars coming, especially in the brighter colors (and there are a lot of bright and interesting colors among the 12 available—two exclusive to the F-Sport trim—including a gold-flecked deep green like an old army jacket imbued with the glitter from a Britney Spears video). The grille, made of dozens of beveled spindles that seem to grow from the car's maw, is a proper detail in that the more you contemplate it, the more you appreciate it; there's a depth and texture lacking on many modern grilles. The bodywork has the opposite effect: it's easy to notice but hard to take in, at least from some angles. (The eye can't escape those yawning wheel arches, great chasms of black plastic.) But a city car is often best considered as a collection of individual angles—a side-effect of overcrowding being a certain squeezing of the vision—and the Lexus is full of those, like its layered light signature of angular, overlapping Lexus "L" shapes. The rear of the car is the cleanest angle and the most futuristic, with one long, striking light signature thanks to a thin horizontal band connecting the brake lights, which also helps make the car more aerodynamic. During the presentation, the vehicle's chief engineer said the rear view was designed to evoke the UX's "strong crossover capabilities"; I couldn't bring myself to ask what was meant by this. Handling: The car feels small and it moves quick—especially the hybrid version, which gets a bit more juice from the pair of electric motors to go along with the 169 hp and 151 lb-ft from the new, naturally-aspirated 2.0-liter inline four-cylinder gas engine. The UX has a petite 34-foot turning circle—so, good for traffic. This is the first Lexus built on the new Global Architecture Compact platform, supposedly rigid, lightweight, and with a low center of gravity. The UX chassis has a snappiness to it, it creates a nice connection with the driver, and anyway it's quiet and comfortable on the highway and ideal for jousting in traffic. 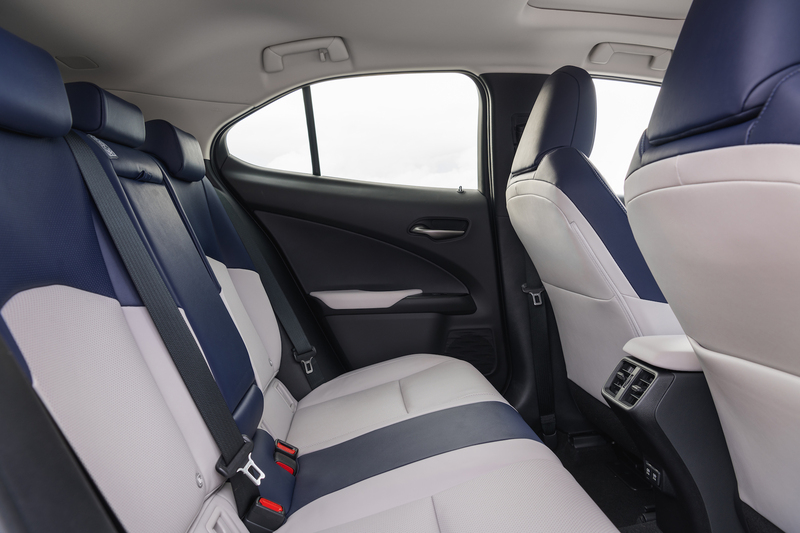 Comfort: The UX is an easy car to jump in and out of, and the foam seats, claimed to be redesigned to reduce fatigue, are excellent—supportive without being hard and soft without being mushy. This is the least-expensive Lexus, and while that's reflected in the materials inside, it doesn't feel cheap. 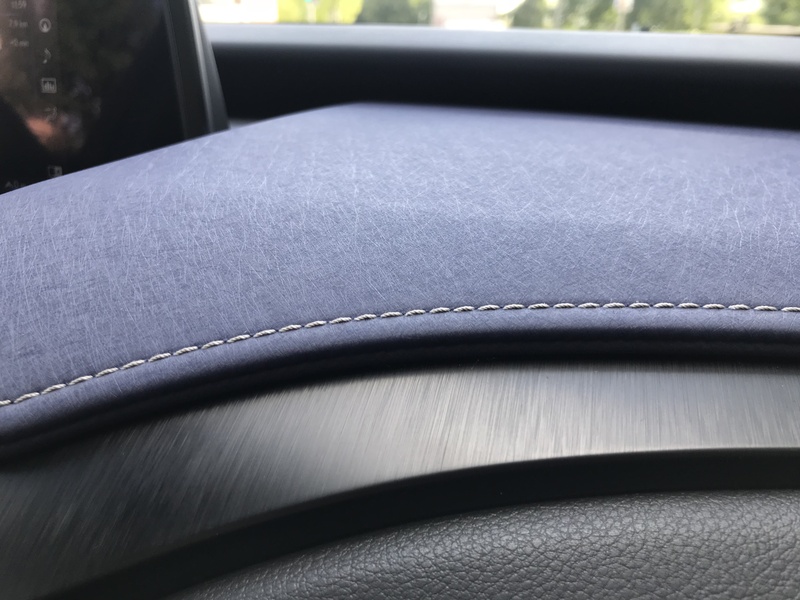 In a way, the simplicity helps the UX—Lexus is know for its creative use of textured materials, but the design tends toward overkill. Here, it's clean and and understated, especially a durable but remarkably soft, paper-like texture called washi, after the grained Japanese paper of the same name. The material has a uniquely calming effect. The Human Machine Interface, Lexus's odd and finicky control pad for its often inscrutable infotainment display (though the camera system gives a good amount of clear information) has at least now broken out the audio controls into a simple, elegant, and ergonomically pleasing armrest control, with scroll wheels or push buttons for channel, volume, and source—simple, easy, good. Standard Convenience & Safety: Aluminum roof rails, eight standard airbags and a six-speaker audio system, and run-flat tires all come standard (you can option a kick-sensor for the rear lift gate). WiFi is available. 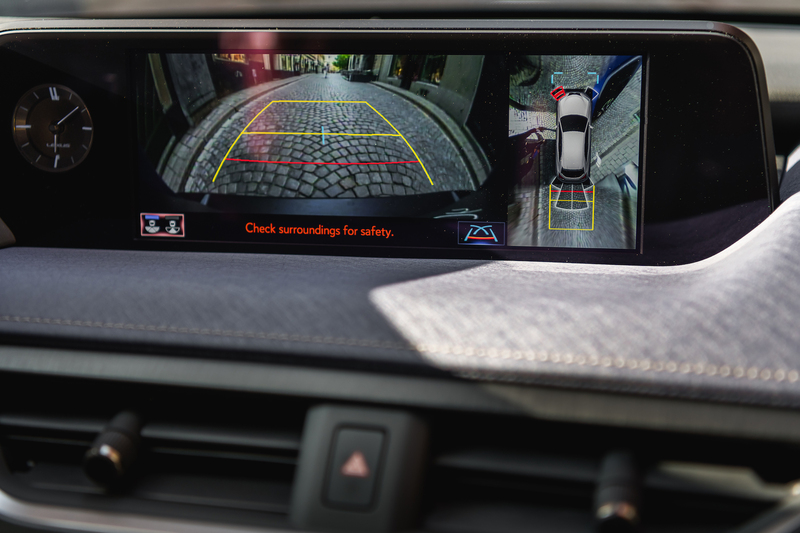 But the real story is that the Lexus Safety System 2.0 comes included, which means: a pre-collision system with pedestrian detection, radar cruise control, lane-departure alert with steering assist, lane tracing assist—that is, if the lane markings go missing or incoherent, the car tracks the vehicle ahead of you instead—road sign assist, and intelligent high beams. 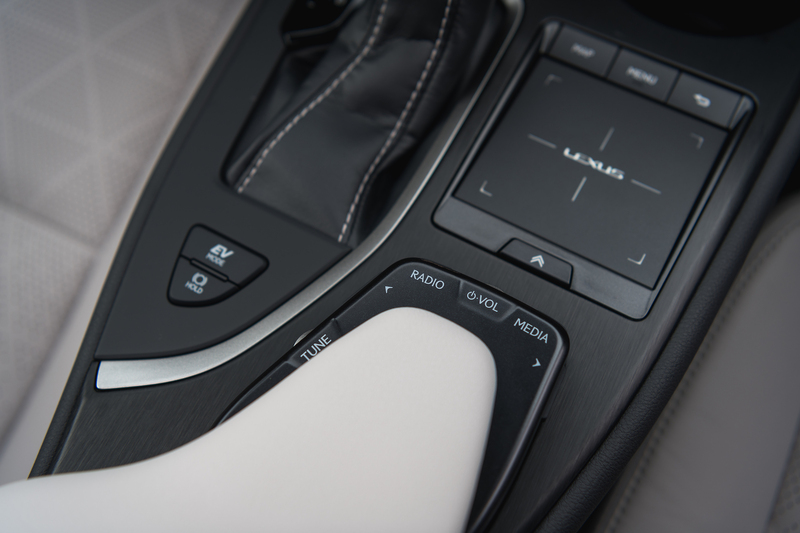 It bears repeating that Lexus's HMI, while improved, is still fundamentally flawed. The trackpad is frustratingly imprecise, and the display tends toward the overcomplicated—at one point, it showed fuel economy as some function of 10-minute increments, or vice versa, which my co-driver, with a math degree, could not suss out—or the surreal, like two slight variations of the same map. 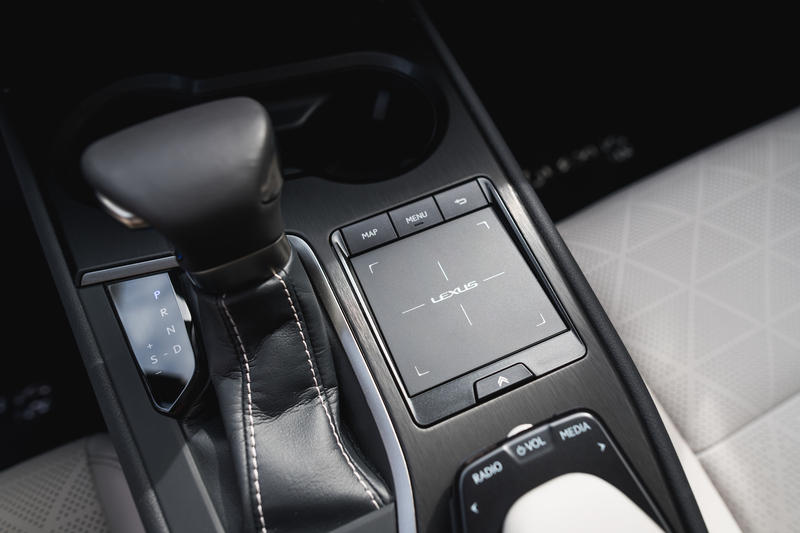 From the press release: "The Sequential Shift feature delivers responsive engine braking force in 10 steps with a shift feel similar to a manual transmission, using steering wheel paddle shift switches or the S position on the shift lever." However, I cannot overestimate how much this "manual transmission" shift feel does not exist—that someone planned on developing a system that created such a feel for the continuously-variable transmission, but forgot, and then the cars were made and the press releases were approved and everyone just decided to pretend like it's there. You can pull those steering wheel paddle shifters to your heart's content, but the only way you're getting "a shift feel similar to a manual transmission" will be by pure dumb accident or if something's gone terribly wrong. Obviously, an around-town car like the UX is not be ideal for hauling lot of stuff—though there are 60/40 fold-down rear seats—or a bunch of people, though it's a fine size for four average-sized adults. If you don't think the move to self-driving cars is coming piecemeal and sometimes in the fine print, check out this bit of creepiness: "Also operational with navigation, Predictive Deceleration Support technology uses accumulated knowledge about a driver’s behavior to predict when and where the vehicle is likely to slow down or stop. For example, when the UX approaches a location where the driver has slowed or stopped in the past, and the driver releases the accelerator pedal, Predictive Deceleration Support increases regenerative braking, allowing more efficient energy to be recovered and recharged into the hybrid battery. The system can provide deceleration support up to about 1,000 feet ahead of the vehicle." It will also add brakes to long downhill descents. Related: It should go without saying, but if you fail to remind a driver how much his car weighs by doing the braking for him, it won't take long for him to forget. This is how one creates the demand for autonomous cars: by encouraging drivers—slowly, steadily—to forget how to drive. With Lexus + Alexa, Amazon's home-assistant has been integrated into all UX models, standard. The service can be used to seamlessly order Amazon products from your car. This was mentioned casually, as if it were not an utterly insane statement—as if, in fact, we've all been clamoring for connectivity and integration so thorough we don't pause our shopping even on the way back from the store. Lexus's long game seems clear through the lens of the UX: appeal to a new buyer unburdened by hard notions of what makes a luxury car. We've seen hints of this thinking before, notably with the Lexus LC500, a moonshot-on-acid, with comic-book styling (a version of the car appeared in Black Panther) and a hooligan's V-8/RWD configuration. That car raised a deliberate flag, even if it doesn't quite make sense: the LC500's sci-fi styling begs for electrification—but instead, some of the high-tech thinking inside the car is applied to restrictive safety systems that hamper the driver's ability to fully wring out that big and otherwise wonderful eight-cylinder. The UX has no such confusion. It's a focused vehicle purpose-built for a specific customer. And the U.S. isn't the main market for the UX (that market would be comprised of European cities like Stockholm, where small-displacement four-cylinders power everything from Volvo crossovers to Audi, BMW, and Mercedes-Benz executive sedans) but if the styling is to your taste, you'll find the quiet and comfort the brand is known for, surprisingly packaged—a practical, quirky, energetic, occasionally convoluted hint of what the brand is pushing towards. Which is to say, in order to get to the Millennials, they first have to go through Xennials like me. Unlike our self-proclaimed Big Tech saviors, carmakers still do the dirty work talking to real people, in the physical world, about what comes next. Prizes include a prototype production budget of up to $25,000 USD. The combined 44 mile-per-gallon hybrid variant won't cost you much more than that. Lexus will take luxury from the roads to the water in 2019.